Callitris neocaledonica, first described in 1914 by Richard Arnold Dümmer (1887–1922), in Journal of Botany, British and Foreign, 52nd edition, is commonly known as Nie, or Winged Chandelier cypress; as well as Cèdre candelabra in the French language. 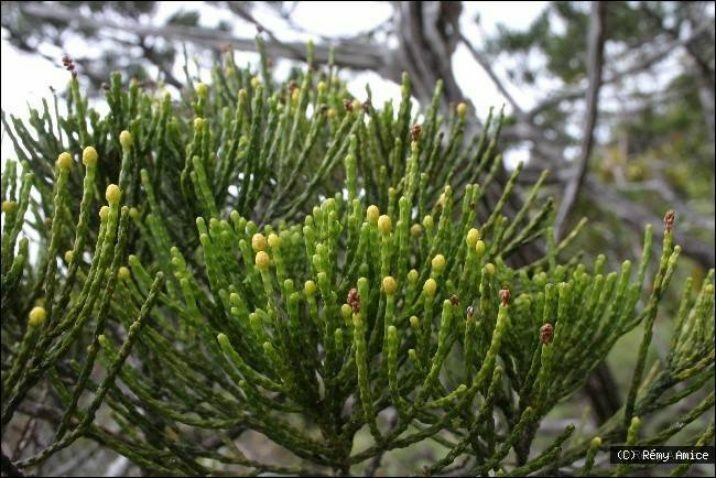 The species name, neocaledonica refers to New Caledonia; this and C. sulcata are the only species of Callitris occurring there. Description. Winged Chandelier cypress is an evergreen coniferous species of tree which will grow to mature heights of 10 to 25 feet (3 - 7 m) tall with a broad, umbrella-shaped crown formed by long branches that turn up at the tips. Bark is thin and shedding, dark brown in color, weathering to gray with age. Adult leaves, which are linear, 0.08 to 0.2 inch (2 - 5 mm) long, dark green in color and sharply keeled. Pollen cones are borne singly, measuring 0.08 to 0.12 inch (2 - 3 mm) long, with 3 to 5 trios of pollen scales, each scale with 3 to 5 pollen sacs. Seed cones are borne singly on short stalks. They are not persistent, ovoid in shape, measuring 0.24 to 0.28 inch (6 - 7 mm) long and 0.3 to 0.4 inch (8 - 10 mm) broad. They are greenish when young, maturing to brown with a 3-angled central column. Seeds are distributed 2 to a scale. Distribution. 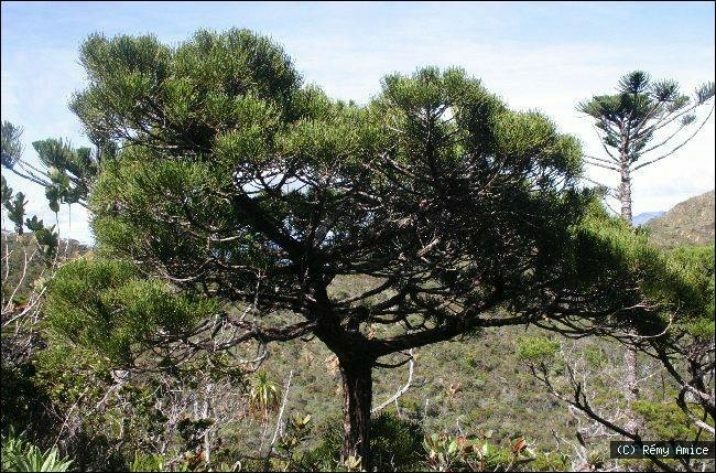 This species is native to New Caledonia where it is found growing at elevations of 3,000 to 4,300 feet (950 to 1,350 m) above sea level in maquis on ultramafic substrates in the southern massif. It has an estimated extent of occurrence of 10 square miles (257 km²) in more than 10 locations. 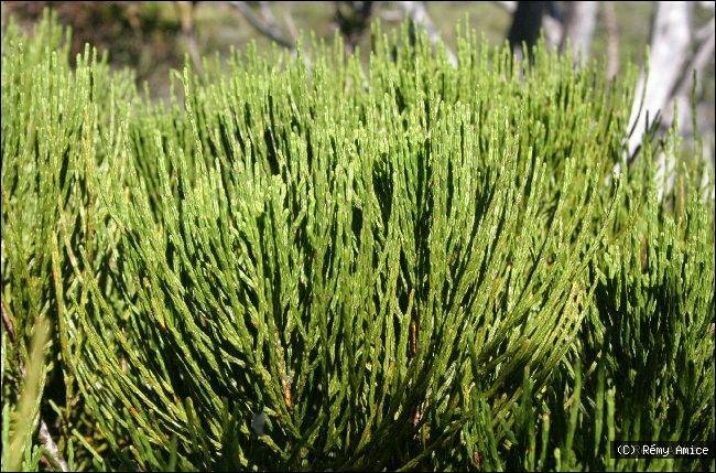 Callitris neocaledonica at Mont Humboldt, New Caledonia — closeup of foliage. Callitris neocaledonica — a mature tree growing in nature. 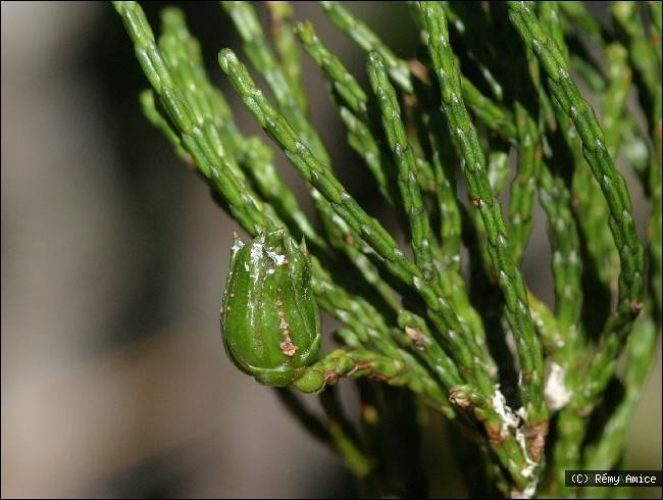 Callitris neocaledonica — a super closeup of foliage and seed cone. Callitris neocaledonica — a super closeup of foliage and pollen cones.